“From start to finish, working with Curious was a joy. The process was exactly what I was looking for – they were open and collaborative in taking on board what I wanted, yet confident and skilled enough to bring their own magic to the table. Aonghus Óg McAnally, Director, Rise Productions. 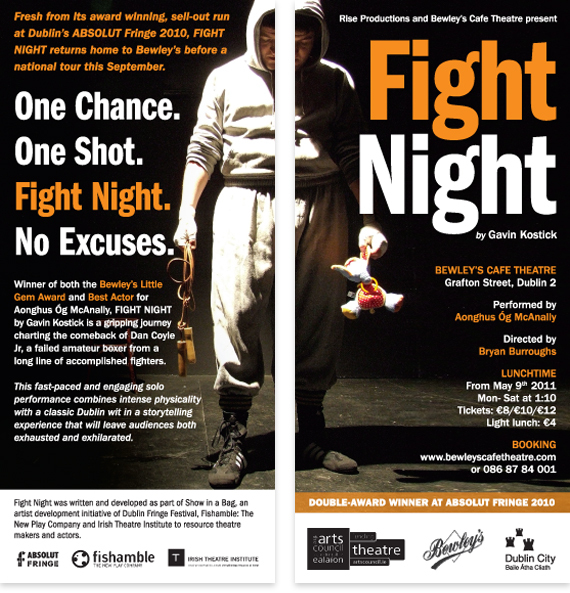 The play Fight Night tells the story of Dan Coyle Jr., a failed amateur boxer from a long line of successful fighters. As he prepares to re-enter the ring Dan must come to terms with the difficult relationship he has with his father while learning to be a father to his own baby son. We split a photo of Dan Jr. across the front and back of the flyer to show the different sides of his character – on one side a boxer, on the other a new father and a troubled son.